Was communicating with Speck a while back about low frequency audio and he encouraged rambling here. Of our three favorite low frequencies in the master mix channel topics (1) cutting bass below 20, 30, 40 or 50 Hz depending on the vibe, (2) centering bass below 80 to 200 Hz within mid-side mixes, and (3) eliminating stereo signals by creating a mono signals below 80 to 300 Hz depending on the vibe, a few words about (3). If you are not familiar with Tone Projects freeware VST plug in TP Basslane, try this magic plug in within your master channel after iZotope Ozone (or equivalent mastering plugin) and adjust to taste. When your bottom is flabby, Basslane may tighten up your mix for zero dollars. Easy and simple to use. I set all below 100-120Hz to mono and set hipass to 25-30Hz to gain some extra headroom. ~50Hz is usually where my fine lows of the kick drum lives so I tend to lift it up a bit - the drawback is I’m losing some total headroom, but I think it’s worth it. Quite often I find myself using multiband comp to tighten up the lows on the “music” sub mix channel. This is my sub mix channel which has everything else except drums and vocals. Does the plugin work with Ardour? 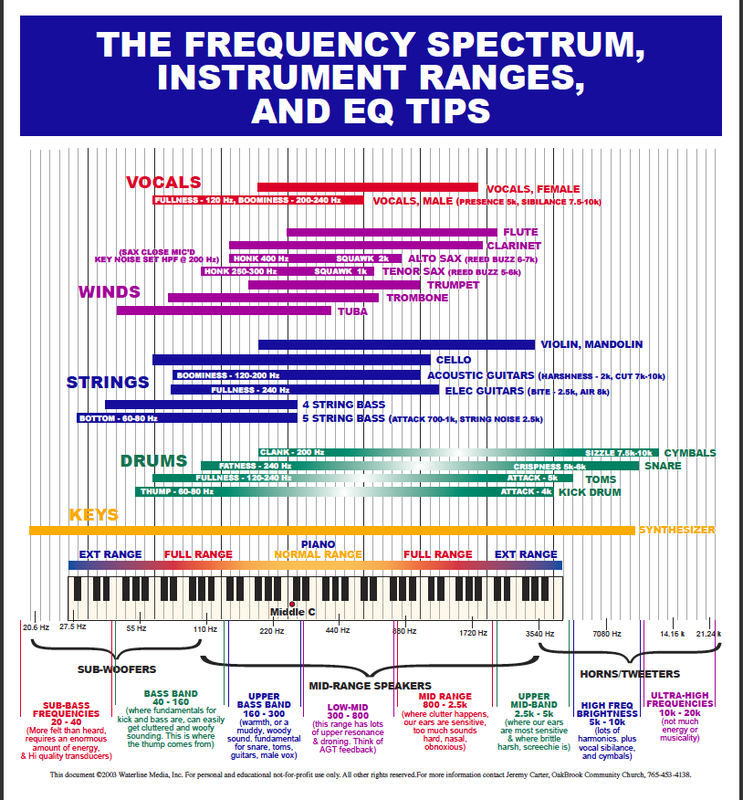 I thought this might a good place to add a basic EQ chart for overall balance before you get to the finer points of mixing. What do you think? I guess Ardour is not free as in beer, but free as in wine. The best explanations I have seen come from Steve Duda and DeadMau5 who may seem glib but knows what he is doing. 1 - Why cut the Bass? Conclusion, is to cut below 20Hz on the master chain. If you do not strip off the sub-bass then it acts like an offset to all the higher frequencies and may push them into limiting and distortion. This discussion is mostly about creating a clean and detailed low end. My link starts a bit early, but Steve continues the discussion from how we hear sounds, drums and how to buss them and then about the low end. Go here if you want to skip ahead. Re: centering bass below 80 to 200 Hz within mid-side mixes. A stereo Bass is fine as long as it does not lose any of its bass when summed to mono. This was covered in Computer Music magazine some time ago, along with the methods of doing that.